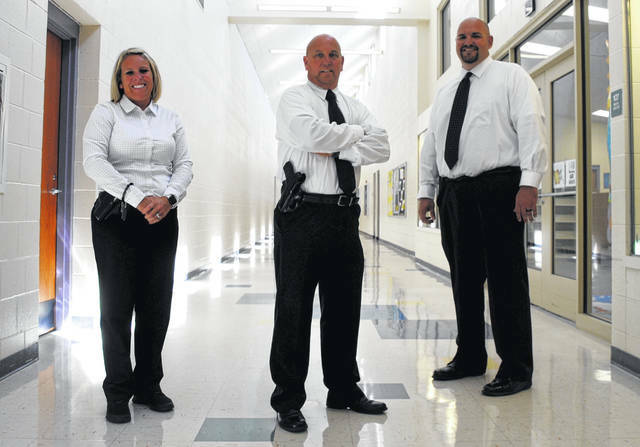 Shown from left are Lynchburg-Clay School District’s new school safety officers, Jennifer Schinkal, Dan Croy and Mike Turner, all three former Highland County Sheriff’s Office staff. Lynchburg-Clay Local School District has hired Dan Croy and Jennifer Schinkal as its newest safety officers, assembling a security team that can cover all three of the district’s properties, according to Superintendent Brett Justice. Croy is retiring from the Highland County Sheriff’s Office after 29 years in law enforcement, and Schinkal has left her post as the HCSO detective assigned to Highland County Job & Family Services. Mike Turner, also a former sheriff’s deputy, was hired as a security officer in 2016 and remains on the team this year. Justice said the board of education approved a resolution to hire two new officers in April, and hired Schinkal and Croy at a special meeting Aug. 6. The board’s decision to hire extra officers was spurred by reports of school shootings early this year, Justice said. From there, the board discussed how many were needed, and officials decided one in each of the district’s three buildings would be appropriate. The high school and elementary school are separate buildings located adjacent to one another on Dawson Road and SR 134, while the middle school is located between SR 134 and SR 135 closer to the Village of Lynchburg. The officers rotate buildings every nine weeks, according to Justice. Justice said Croy and Schinkal had both responded at different times to incidents at the school, and the board was pleased with the way they handled those situations. “We feel very good that we’ve added two very high-quality professionals that we’ve seen in action at our place,” Justice said. Justice said the new officers have been “well received” by parents, staff and community members. Schinkal and Croy both said they are happy to be on board. According to Justice, all three officers are expected to develop “a great personal relationship” with both students and staff in addition to providing security, so they know the personnel and students in each building as well as the safety procedures where they’re located. Schinkal, who worked closely with children as the detective assigned to JFS, said the three officers don’t want to be seen as intimidating. In fact, they want to be a positive presence in the school — guardian angels with a listening ear. During Schinkal’s interview in the lobby at the elementary school, an elementary student ran up to Schinkal and hugged her knee before leaving for the day. The two spoke for a few moments, and during their brief, earnest conversation, the student glanced at the gun on Schinkal’s hip. The child asked if it was a gun, and Schinkal said it was. “It kills bad guys?” the student asked.